India's $35 tablet takes on OLPC with Android? In the quest to deliver a high-tech learning device that anyone can afford, India's Human Resource Development Minister, Kapil Sibal unveiled a prototype for a $35 tablet computer Thursday. Sibal said it is an answer to the "hundred dollar laptop" from MIT, which later launched as the One Laptop Per Child project. In 2006, India's Education Secretary Sudeep Banerjee reportedly criticized the $100 laptop project as an underdeveloped idea that was "pedagogically suspect," and research began within India to create a local version of the device. 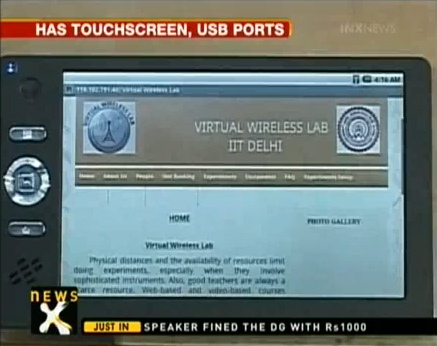 Thursday's prototype is the result of work from the Indian Institute of Science Bangalore (IISc,) and four campuses of the Indian Institutes of Technology: Kanpur, Kharagpur, Madras, and Bombay, and the cost reportedly includes the touchscreen, 2GB of RAM, Wi-Fi, and USB ports. "The chips, processor, and connectivity cost $35," Sibal said in Thursday's press conference, then followed by saying that it's "...including display, memory, everything." While it has been described only as running an "open source" operating system, video footage from the conference clearly shows the telltale Android notification bar across the top of the device's screen. Meanwhile, the OLPC India Foundation, established in 2008, has ten testbeds for the OLPC XO-1 in New Delhi, Uttar Pradesh, Bangalore, Tamil Nadu, Nashik, Dugawar, Maharashtra, Hyderabad and Goa.